The Ibanez 2018 S1070PBZ Premium Electric Guitar in Cerulean Blue Burst is perfect for professionals who want the ultimate in comfortable playability and sonic brilliance, completed in a visually captivating package. 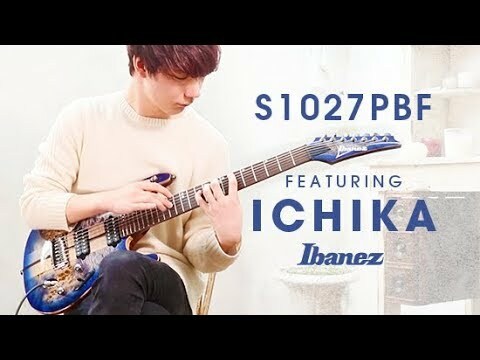 The S1070PBZ benefits from Ibanez's razor-thin S series body profile, which is designed to establish as natural a playing feel as one could desire. The elegant, ergonomically designed curves are met with steadfast durability that offers the best of both worlds. The gently arched top pairs with the deep double-cutaway body profile to afford unfettered access to the neck and body in their entirety. The body is built using African mahogany, which lays a warm mid-range tonal foundation. Paired with the mahogany is an intricate poplar burl/walnut/curly maple/panga panga top, finished in a glorious cerulean blue burst. Fitted to the body of the S1070PBZ is a masterfully built 11-piece panga panga/maple/walnut/purpleheart neck. The resilience of the design belies its slender shape, and thanks to the Wizard profile, you can race through chords, riffs, and solos without a care in the world. Paired with the neck is a bound panga panga fingerboard, which has been treated to Ibanez' Premium fret edge treatment for seamless transitions between each and every fret. The 24 frets at your disposal at decorated with mother-of-pearl off-set dot inlays, as well as luminescent side dot inlays to guide your way on the darkest of stages. The Ibanez S1070PBZ Premium is equipped with a trio of DiMarzio pickups with an Air Norton, a True Velvet, and The Tone Zone in the neck, middle, and bridge positions respectively. The DiMarzios are perfect for making the most of the tonewood's versatility, and are fantastic for generating a huge dynamic range for you to take advantage of. Whatever kind of musical style you wish to execute, these pickups will see you through, but if you're a fusion, rock, or metal player, then you will adore how much they open when you give them a push in the right direction. The Ibanez 2018 S1070PBZ Premium Electric Guitar in Cerulean Blue Burst is equipped with an Edge-Zero II tremolo bridge with Zero Point 3Fe locking system. Control over the bridge couldn't be simpler, thanks to the dial in the spring cavity that can be attenuated with ease - a bonus for those who like to perform elaborate trem bar gymnastics. The headstock is home to Gotoh MG-T locking machine heads, which uphold tuning integrity with precision throughout the most bombastic of performances, allowing you to rock out to your heart's content.